Military engagement has been the last resort of political conflicts since the beginning of civilization. In many battles, numbers have decided the issue. When asked what he needed to defeat Napoleon, Duke Wellington is said to have pointed at a mere infantry soldier and asked for more of him. However, the historical record is dotted with upsets in which smaller or less well-equipped forces have pulled off victories due to their tactics or their bravery. In rating the greatest military upsets of all time, this article uses a few simple criteria. These must involve single battles and not entire conflicts such as the War of the Roses or the Second World War. They must result in the lesser force winning the battle surprising most contemporaries. They must also have a dramatic effect on the politics of the world or history in general. 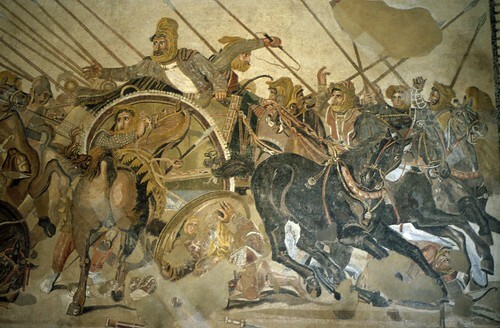 In 490 B.C., the Persian Empire was set to invade Greece. This was not meant to be a momentous occasion. Persia was the greatest civilization on the planet and Greece was just another backward border region in need of civilizing. The 10,000 Greeks who managed to rush to meet hundreds of thousands of Persian troops on the plain of Marathon wanted to buy time for the rest of Greece as it prepared to stop these invaders after they disembarked from their ships. The Greek infantry flanked the Persians and destroyed them. Greece remained free but wary until the rise of Alexander the Great. Phillip II had subdued Greece in the mid-4th century under Macedonian leadership. His son, Alexander the Great, led a small but vigorous force of 40,000 men into the heart of the Persian Empire. Near the ancient town of Issus in what is now modern-day Turkey, his forces met hundreds of thousands of Persian soldiers and their allies. Trapped between mountain cliffs and the seashore, the Persians could no use their numbers to outflank Alexander. He destroyed the Persian force and went on to roll over the remaining forces, uniting the known world from Greece to India briefly under his leadership. The French had superior forces, armored cavalry and they fought for their home territory. The English, however, had Henry V and the longbow. In 1415, near the town of Agincourt, the forces of both countries met in a restricted terrain that favored the weaker forces. That would not have been enough to defeat the French. Instead, Henry V flanked the French, who had twice as many men, with archers and mowed them down before they could devastate his infantry. The Japanese had sunk many of the most powerful ships of the US Navy in the Pacific in late 1941. In the six months that had passed before that first week in June 1942, the Americans had rushed naval ships to the pacific but were far from matching the strength of the Japanese. The latter brought half a dozen carriers and as many battleships to battle near the Island of Midway. The US Navy had a few carriers and little else. Their initial waves of bombers were either shot down or failed to hit their targets. The last wave, low on fuel, surprised the rearming Japanese carriers and sank three carriers, equalizing the forces in the Pacific for the first time. While many Israeli soldiers fasted and prayed for the Jewish Day of Atonement in 1973, the Syrians prepared for war. The Yom Kippur war began with a fierce attack on the Golan Heights from approximately 1,200 Syrian battle tanks and 50,000 troops. The Israelis had no more than 170 tanks and a few thousand defenders. In a series of bloody, head-to-head encounters, the Israelis held off the superior force and preserved the state of Israel. Darren Walker is a military historian and guest author at MilitaryEducation.org, where he contributed to the guide to military friendly colleges. Click here to see the greatest military tacticians of all time. I’d say America winning battles in its fight for independence was an upset, since Britain, who had the greatest navy in the world, was defeated, and one of the top world powers of today was born.